When a member of the hacker group, Everyone, is framed for the murder of a rival, Sherlock and Joan must find the real culprit. Watch Elementary Season 3 Episode 19 online as Sherlock and Joan investigate Everyone's inner sanctum. Sucking Chest Wound from the hacker group, Everyone, wants to hire Sherlock to dig up dirt on his rival, Species. It appears the group is in the midst of a civil war. Species wants the group to become more political and radicalized while Sucking Chest Wound and his allies want it to remain the same. Sherlock declines to investigate. Later, he receives a phone call from Detective Bell at a murder scene. It's Species. When Sherlock investigates the body he finds a pink hair from Sucking Chest Wound. He denies being the murderer and claims to have an alibi. But when blood matching Species is found in his car, he is arrested, even though he is alibied. Meanwhile Sherlock notices that Joan has been withdrawing from friends and isolating himself. He confronts her, but she denies any change. While examining Species correspondence from Everyone's chat room, Sherlock notices two distinct styles and realizes there are 2 people who use the name Species. But when they finally identify the second person, the FBI intervenes and protects him. Why would the FBI protect a murderer? Why is Joan withdrawing and isolating herself? Watch Elementary Season 3 Episode 19 to find out the answers. 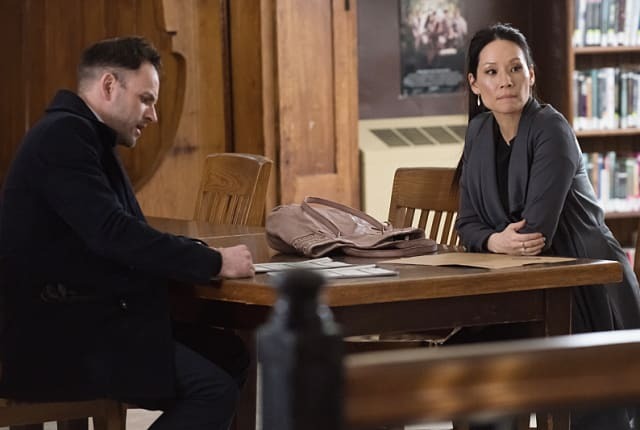 On Elementary Season 3 Episode 19, when a member of the hacker group, Everyone, is murdered, Holmes and Watson find themselves in the middle of a civil war on the internet.